REGINA, SK – The Regina Leader-Post reports that the Government of Saskatchewan has introduced changes to alcohol legislation that will allow growlers of beer to be sold at many more locations in the province. 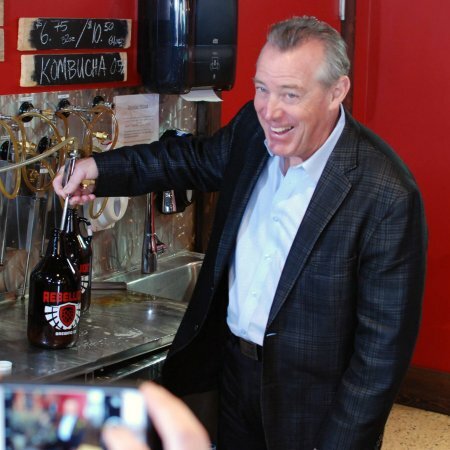 At a press conference held at Regina’s Rebellion Brewing earlier today, Minister Don McMorris (pictured) announced that in addition to the previously allowed sales at breweries/brewpubs and farmers’ markets, growler fills can now be offered at off-sale outlets, franchises, private stores and SLGA locations. According to the press release announcing the changes, retailers applying to provide growler fills to customers will need to feature Saskatchewan-made beer on at least one tap if there are four or fewer taps on the station, and at least two taps if there are more than four in total. Growler stations will be launched at two SLGA locations – one in Regina and one in Saskatoon – in coming months.